Chapter 520 of popular Japanese manga Fairy Tail had some of the biggest surprises till date which will surely define the path of the series. Fortunately, Natsu’s future doesn’t appear dark for the time being, while Erza’s battle against her own mother and Queen of the Dragons, Eileen Belserion reached its eagerly awaited and expected conclusion. Chapter 519 of Fairy Tail proved why Erza was chosen as the “Queen of Fairies” by the common folk. Her fearless and selfless act of courage was ample indicator of her pure heart and noble intentions. In the previous chapter, Erza was seen hurling herself towards the meteorite that was pulled in by Eileen using “Master Enchantment.” Given the humongous proportions of the meteorite, it was believed that Erza might surely perish if she smashes herself against the gigantic rock. However, Erza proved the naysers wrong by obliterating the meteorite from within and returning to the Earth. Fortunately, not only was Erza’s near certain demise averted, Wendy extended the Dragon Slayer Magic within her and bestowed the same to Erza’s blade, enabling the latter to wound Eileen. However, the biggest surprise was Eileen’s suicide. Having healed her heart, Eileen chose to end her own life because she couldn’t bring herself to kill her own daughter. Fortunately, the current chapter numbered 520 and titled Dragon or Demon finally shone the light on Natsu Dragneel. The protagonist of Fairy Tail had been neglected for quite a few episodes. 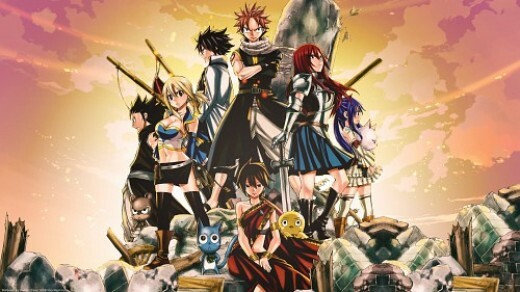 Mangaka Hiro Mashima had revealed that Natsu is dying, but hadn’t offered much information, apart from the fact that the “Dragon Seed” and the “Demon Seed” within Natsu were trying to combine, which would eventually lead to Natsu’s demise. Meanwhile, several characters from Fairy Tail paid Natsu a visit in his heart, and interacted with him, while poor Natsu lay dying in Lucy and Happy’s arms. After Eileen’s death, Erza hugs Wendy for comfort and consolation. However, Wendy notes that she can’t get “Master’s scent” from the battlefield. It is obvious that Wendy was referring to Master Makarov’s scent, and its disappearance indicates his soul might have left for the afterlife. The scene shifts to Natsu’s heart, where he is in conversation with his father, Igneel. Natsu’s father reiterates the ominous prediction about Natsu’s death. He repeats the reason of his impending demise, but categorically emphasizes on the “human” aspect of Natsu. Given’s Natsu’s nature, he interrupts Igneel stating he had a lot to accomplish before he dies. He adds that defeating Zeref and Acnologia were his primary missions. But instead of offering any consolation about his soon-to-arrive death, Igneel lightly raps Natsu on the head. The method of reprimanding doesn’t sit well with Natsu, who demands some compassion from Igneel. However, Igneel silences Natsu and asks that the latter listens to what he has to say. Igneel explains that Natsu could die due to the two seeds, namely the Dragon and Demon, “mixing together.” He cautions that Natsu has to ensure the two seeds are not allowed to mix, and to do so, he must “choose one or the other.” As expected, Natsu appears confused, and once again, Igneel offers his advice. The dragon states that Natsu must strengthen his will and declare what it is that Natsu wants to be, a demon or a dragon. Natsu recalls his conversation with Zeref, back when the Dark Mage had instilled the E.N.D magic within the former. Natsu appears confused, but quickly gains his composure, stating that he is neither a dragon nor a demon. Natsu asserts that he is human, and intends to stay that way. Igneel appears quite pleased with Natsu’s strong resolve and clarity of thought. The reason behind Igneel’s approval becomes quite apparent when the Dragon and Demon seed battling within Natsu immediately disintegrate, ensuring Natsu stays alive for the foreseeable future. Igneel notes that even though Natsu was revived with “demonic power,” and raised as a dragon, he was and is still a human. Interestingly, it was Natsu’s own distress that caused the seeds within him to grow and start battling within him. Igneel blesses Natsu, while a bright light starts flooding the scene, and the next instant, Natsu wakes up in Lucy and Happy’s embracing arms. Natsu is quite surprised to see Lucy naked, but, his grandmother explains the situation and Lucy’s altruistic intentions. Having been in a deep slumber, Natsu appears to be refreshed and rejuvenated. In the earlier chapters, Happy had revealed how defeating Zeref might end Natsu’s life too, and Lucy isn’t too happy about the same. Natsu asks about Gray Fullbuster and Erza’s whereabouts and appears concerned about the Scarlet Mage when informed that she is still on the battlefield. Chapter 520 is undeniably quite critical for the Fairy Tail manga because it reveals Natsu won’t undergo complete dragnonification and will stay as human. Moreover, with his friends quite close to him, the Fairy Tail Guild is stronger than ever.